Calculation of the lunitidal interval will give an accurate prediction during a high tide. In order to get an approximate value, the moon-rise, moon-set and high tide times should be known for a specific location. 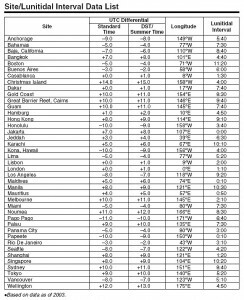 The resulting table gives the lists of moonrise/moonset times for the coming seven days. To view the list of moonrise/moonset times for the whole month, click on the “Modify Parameters” box at the top of the table. Then click on the “Show” tab. The same box can be utilized to select a different month or year from the previous one. Once you have seen your desired date in the table generated in the earlier step, look at the “Time” column under “Merdian Passing”, which is just to the right of the “Moonset” column. The time listed in correspondence to the date is when the moon passes over the meridian on that particular date. Note down this time, along with the date. The meridian time that was written in the previous step must be converted from AM/PM to 24-hour time. For your convenience the link, which is given below can do the conversion in case of any difficulty. Carefully, note down this new time, along with the date. 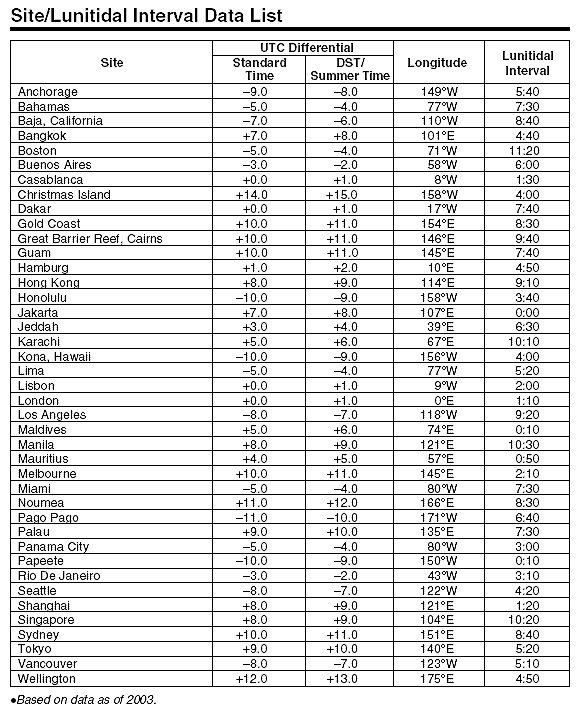 The resulting table gives the tidal information for the next two days. Scroll down to “Prediction Options” if you want information for a different date and reset the fields under the tab “Starting time and time display options” for the required date. Again scroll down to the bottom of the page and click “Make Prediction Using Options”. Once you have generated a table, listing your desired date find the first high tide occurring after the 24-hour meridian time you noted down previously. Note down the high tide time, along with the date. Enter the previous value of the 24-hour meridian date and time in the “First date and time” field. Similarly in the “Second date and time” field, enter the high tide date and time that you noted down earlier. The resulting time will give you the lunitidal interval. There are some clocks and watches such as tide clocks that generally work by using a 12 hour 25 minutes cycle. In the UK and Ireland, these devices would vary between plus or minus 30 minutes over a span of 30 days. Hence, it is essential to reset them on a monthly basis by using local tide tables. Tide or tidal watches have a moon/tide mode that require lunitidal intervals in order to predict high and low tide.